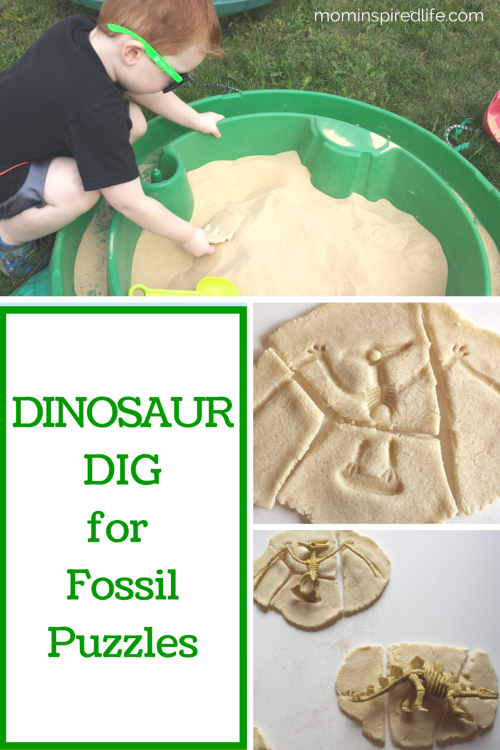 Many preschoolers are fascinated by dinosaurs and this dinosaur dig for fossil puzzles is sure to excite and engage young learners. This week the PLAYful Preschool theme is dinosaurs! The team is bringing you so many fun dinosaur activities you can do with the preschoolers in your life. Don’t forget to scroll all the way down to the bottom of this post and check out their activities as well. This is sure to be an exciting #PlayfulPreschool week! 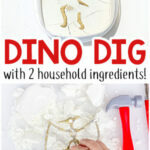 This activity uses a couple of simple ingredients that most of you have at home and turns them into an exciting dinosaur dig activity that is sure to please the preschooler in your life. 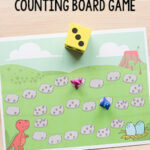 Evan LOVES dinosaurs and this activity took his interest in them to an all new high! 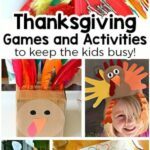 It may seem like an elaborate or time-consuming activity to prep for, but it really is pretty simple and worth some extra effort anyway. 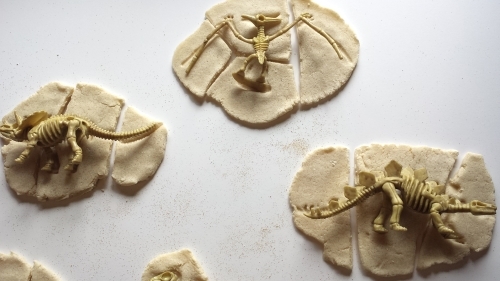 This activity teaches children about fossils and the paleontologists who unearth them. It gives them a chance to explore these concepts in a hands-on way that is sure to leave an impact and help them retain what they have learned. The puzzle portion of the activity also utilizes critical thinking skills. Salt – 1 cup *I found recipes that called for 1/2 cup instead of 1 whole cup. I plan on trying that next time. Before starting the excavation, we read two books on the topic. The first is Dinosaur Bones by Bob Barner and the second is Bones, Bones, Dinosaur Bones by Byron Barton. 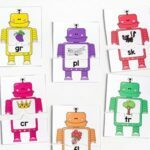 They are perfect for preschoolers because of their simplicity, rhythm and illustrations. However, both books are great for all ages. They were an excellent introduction to what fossils are and what paleontologists do. Evan and I highly recommend them! 1. Combine flour and salt. Slowly add water until you reach a dough-like consistency. You can always add a bit more water if 1/2 cup is not enough. 2. Knead the dough until it is smooth. Separate into 5-6 chunks and roll each out on a lightly floured service. It needs to be about 1/2 inch thick so that the skeletons don’t poke through to the other side and make holes. 3. 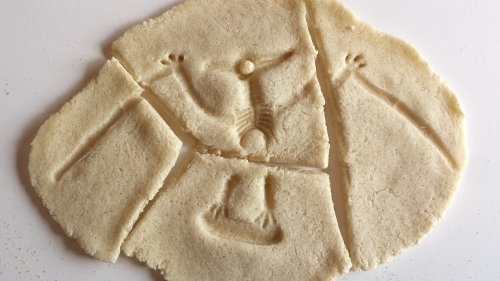 Press dinosaur skeletons down on the dough until you have a good impression. Place on a cookie sheet. I lined mine with wax paper. Then use scissors to carefully cut the skeleton impression into 3 or 4 pieces. 4. Bake at 200 F for approximately 3 hours. I checked every hour or so to make sure they were coming along ok.
5. 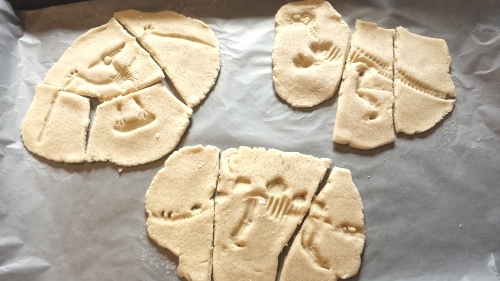 Let fossils cool completely after baking. 6. 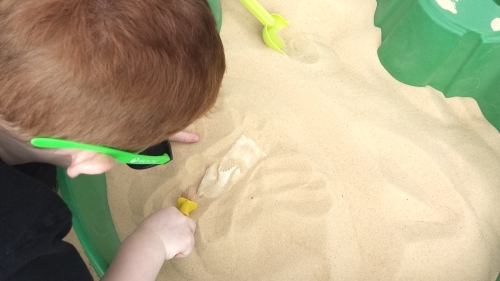 Hide fossils in a sand box or a bin filled with play sand. I brought Evan out to the sand box and told him that we were going to go digging for dinosaur fossils. He then used the shovel and rake tool to dig the fossils out of the sand. Once he had found all the fossils in the sand we brought the inside to dust them off and piece them together. We laid them out one by one and Evan used the paintbrush to dust all the sand off them like a paleontologist would. Then we began putting the pieces together. This was actually quite difficult, so I helped. We used the toy skeletons as a guide for which pieces belonged where and we matched them up to the complete fossils to verify that we were correct. This activity was so much fun! Evan was VERY excited about the whole process. I love that he learned about fossils and paleontologists in a hands-on way that is likely to leave a lasting imprint! 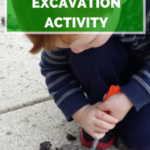 If you like this activity, you are sure to LOVE our dinosaur fossil excavation activity as well! 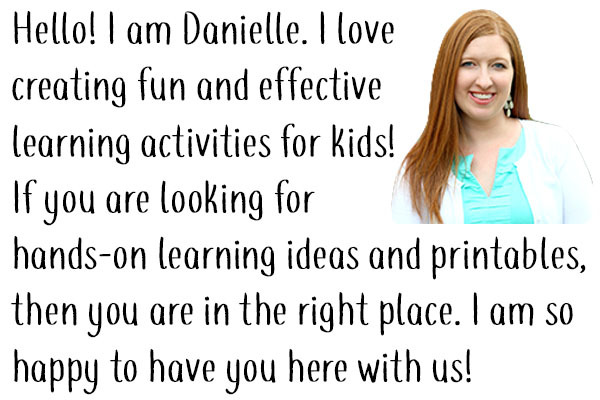 Don’t forget to check out all of the posts from the PLAYful Preschool team below! 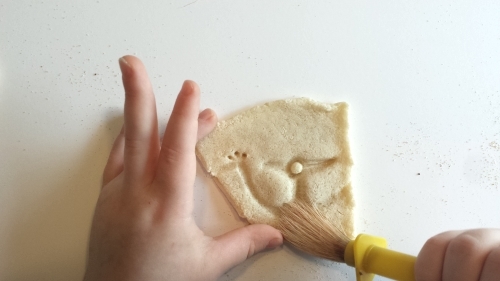 For even more ideas, check out my Dinosaur Theme Pinterest board! 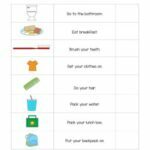 Follow Mom Inspired Life’s board Dinosaur Theme for Preschool on Pinterest.